At least six decades’ worth of die-hard Bulldog fans were waiting to be “set off,” as the fight song goes, Friday under the lights at Bulldog Bowl. 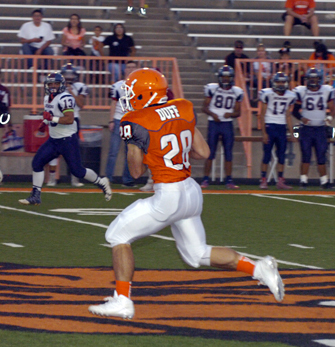 With a huge Homecoming crowd on hand to roar their approval, the Artesia High School football team made a marquee-worthy opening statement against the Wildcats of Deming, as junior quarterback Taylor Null found senior slot Ethan Duff for a 69-yard touchdown on the game’s first play from scrimmage. From there, it was all orange, as the ‘Dogs romped to a 49-6 victory over the ‘Cats that places them at 4-0 on the season. The Big Orange offense would go on to cap all but one of their eight drives on the night with a touchdown, while the Orange Crush allowed just a single fourth-quarter score, forcing six punts, one turnover on downs, and a fumble. 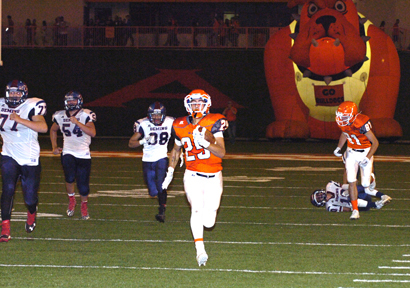 The Bulldogs were able to breach the checkerboard twice more in the opening quarter of play Friday, tacking on their second TD on another single-play series, this time a 52-yard catch-and-run from Null to Chaney Hardt at the 4:58 mark. The ‘Dogs then beat the clock with another Null-to-Duff connection, this time from six yards out, to go up 21-0 with three seconds left in the first. 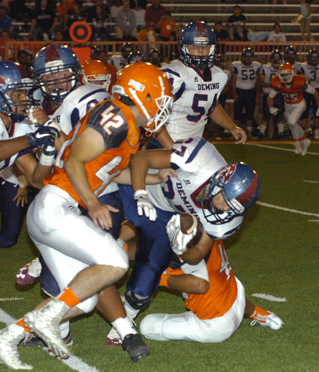 The Crush would hand the ball right back to start the second, as a fumble by QB Cristian Metz was recovered by Eddie Pando at the Wildcat 39-yard line, and following six plays up the short field, senior running back Isaiah Weideman darted in from the six to put Artesia on top 28-0. 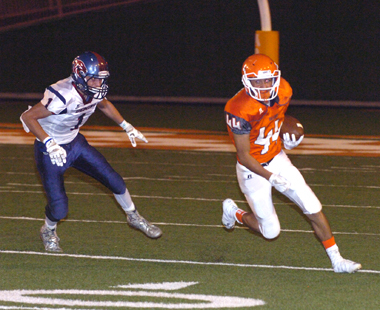 The boys in orange would keep the big plays coming following a Wildcats three-and-out, as Null added a 62-yard score to his tally with a pass to Dominic Madrid, setting the mercy-rule clock in motion with 6:04 to go in the half. 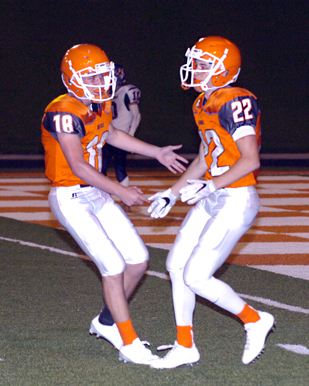 Artesia elected to start the third quarter with their second-string offense, who kept the scoring streak going under the arm of sophomore quarterback Trent Taylor, who found Hardt from the 19 to make it 42-0 with 4:18 left in the period. The ‘Cats carried their lone touchdown drive over into the fourth quarter, marching 80 yards on 14 plays, the last of which – a four-yard plunge by Armando Perales III – prevented the shutout. 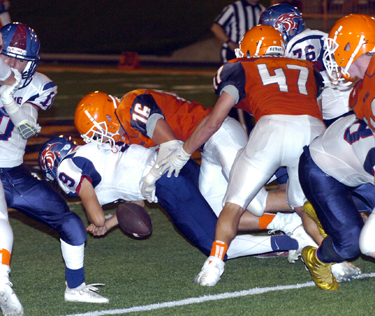 The PAT was blocked, however, leaving Deming with six, and the ‘Dogs would follow with their fourth one-play series of the night, an 80-yard TD sprint by Weideman that rounded out the final, 49-6, with 5:26 left in the game. 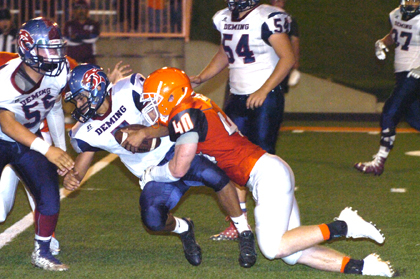 Artesia finished with 415 total yards of offense Friday to Deming’s 197. Null was 6-12 passing for 206 yards and four touchdowns, Weideman ran for 89 yards on three carries and two touchdowns, and Duff (2-75), Madrid (3-72) and Hardt (2-71) led the receiving corps. The Bulldogs will now begin preparations for their biggest challenge to date as they host the Class 6A second-ranked Cleveland Storm at 7 p.m. Friday at Bulldog Bowl. The Storm are also 4-0 on the season with wins over Onate (24-14), La Cueva (38-37), Las Cruces High (49-42) and Centennial (49-33). “It’s been a good start,” said Henderson. “We haven’t been tested to the point we’re fixing to get tested to next week, but I feel like our guys have done a good job of taking advantage of the opportunities they’ve had, scoring points, playing good defense, and really solidifying the kicking game over the last couple of weeks, so there are a lot of positives there.